Seems simple and straightforward enough. The thing is, the college was Clown College, run by Ringling Brothers and Barnum and Bailey Circus. Somehow, amid all of the circus hype and the big clown shoes, these two formed a great friendship that (eventually) led to an onstage partnership and (finally!) to marriage. Performing together since 1996, Steve and Kobi have established themselves as a premier entertainment company. 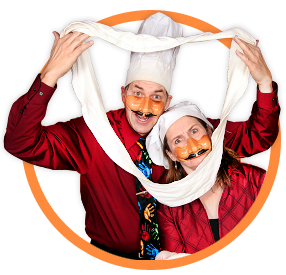 Their delightful blend of comedy and juggling is featured nationwide on TV, at fairs, festivals, corporate meetings and family events. Always Clean, Always Fun, Always Funny! At a time when “Family Friendly” entertainment is hard to find, In Capable Hands really delivers! They are able to bridge the gap of generations with their humor. Every age group “gets it” at their own level. While the kids are laughing at the physical comedy, the older folks are guffawing at the wit. And when the whole group gets laughing at once, then you have a great moment of community! Steve and Kobi work hard to ensure that the show you see is worth your time and attention. 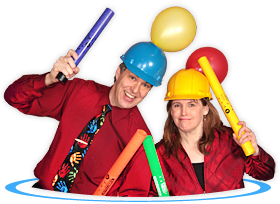 They are famous for “finding the funny” in unusual and creative ways, giving your audience a show that is fresh, new and out of the ordinary. On Time, Reliable and Personable! Your worries fly out the door! Steve and Kobi are prompt and proactive. Because they travel with everything they need for a show, all you have to do is sit back and enjoy. They will be there way ahead of their performing time and will stick around to shake the last person’s hand. They’ll keep on schedule and even help you promote other aspects of your event. No complex hoops to jump through. No contracts with outrageous demands. Just contact Steve and Kobi via email, by phone (1-715-962-3346) or Talk to the Hands! You are promised a prompt and courteous reply with booking information.